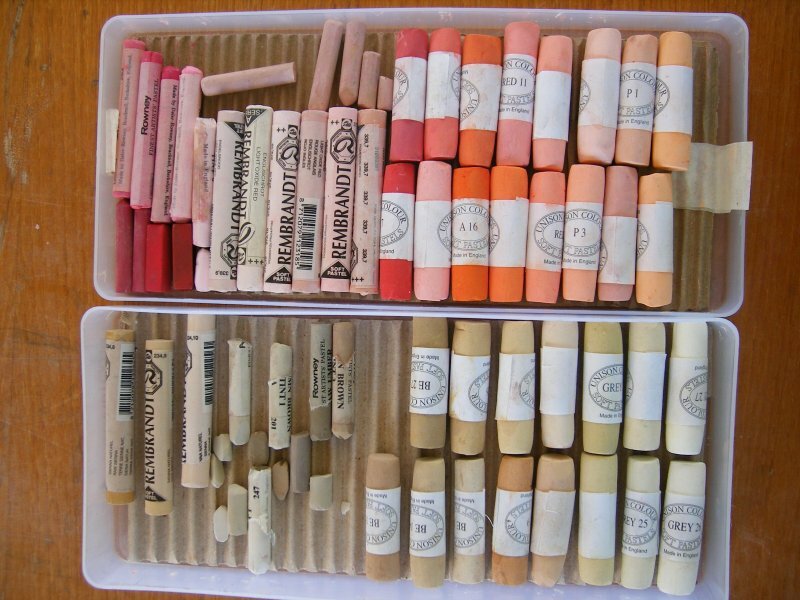 This post describes yet another way coloured pencil artist Lesley Crawford has found to store her art materials. 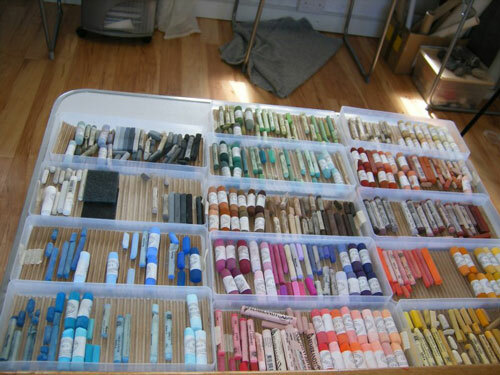 Earlier this month this blog has a post about Storage for Unison pastels. 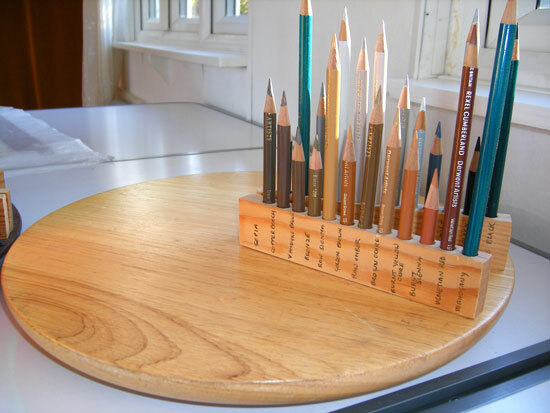 This post is about how to create a "Lazy Susan" pencil holder for coloured pencils. 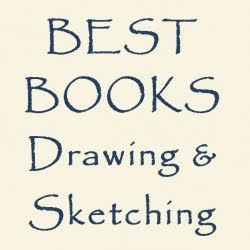 How many times do we see great ideas for helping us sort out our studio in books? But do we all put them into practice? Like many coloured pencil artists, Lesley likes to have all her art materials and storage sorted while working in her studio. She used to have problems with tins and boxes of coloured pencils all over her desk. They took up too much space. Plus she also didn't like the way she had to shuffle through pencils bunched together in jars, especially when the shorties fell to the bottom! Then she saw the Lazy Susan Pencil Holder - as pictured in the Colored Pencil Solution Book by Janie Gildow and Barbara Benedetti Newton. She asked her husband David if he could work out how to make the pencil holder from the picture! This is her explanation of how it came about once David had studied the picture and worked out how to make it. Thanks to Lesley and David for both the story and the pictures - and thanks to both Janie and Barbara for the inspiration! Here's the instructions for making a pencil holder. It's very simple to make. Lazy Susan (a circle of wood on a small circle of wood joined by ballbearings so that it spins round - available from kitchen shops). The one we bought is 14 inches in diameter - see right. Timber 35mm x 14mm - from DIY stores, very cheap. Usually comes in lengths of around 2 metres. Choose a drill bit that is slightly larger than the diameter of your pencils. Put a piece of tape around the bit 30mm from the tip - this will prevent you drilling through the bottom of the wood, and will make all the holes consistently deep. Drill one hole and check that a pencil will fit, if it is tight then use a slightly larger bit. Drill a line of holes along the narrow side of the wood, with a slight space beween each one - I got 14 holes per strip. Make as many units of two pieces of wood as you need. 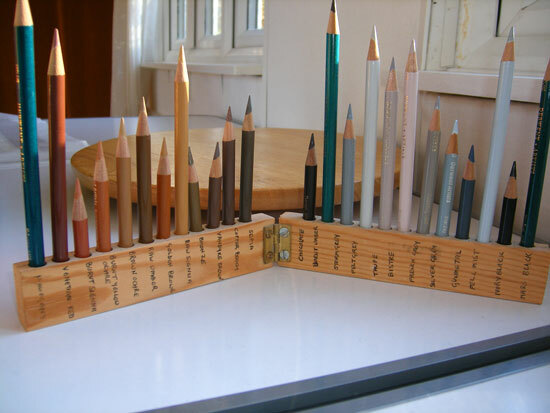 Sort your pencils out as you want them to be arranged, and write the names on the wood with indelible ink - ballpoint pen fades over time. 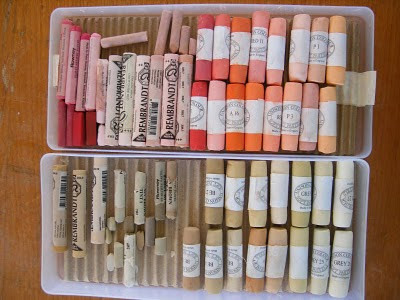 This then held all my original set of Derwent pencils. 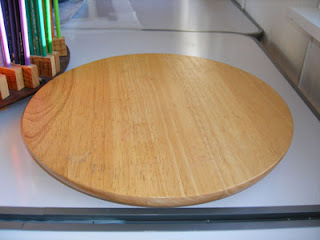 However as my collection increased, it got a bit crowded, so I cut a piece of plywood into a circle of 18 inches in diameter, and screwed four small blocks on it so that it would sit tightly on top of the original lazy susan. I now have 11 units of paired strips, holding a total of 308 pencils - all in a footprint of 18 square inches. I have my complete sets of Derwent Artists, Faber Castell Polychromos and Prismacolor Verithins, plus a few odds and ends from other sets. In the centre is a tub which holds tools, erasers, blenders etc. You can keep the whole thing on the desk, or lift off as a unit off to use separately. The pencils are always in the same order so you soon get to know where they are, and it is easy to put your hand on exactly the one you need. DO let me know by leaving a comment and a link or contacting me (see right hand column). Recently I was looking at the Zest-It site and spotted something that's new to me - and I guess a few other coloured pencils artists too. It's called a Zest-It Blending Sponge. It immediately put me in mind of one of those sponges that a lot of people use to apply "stuff" to their faces - and I was guessing it probably worked in pretty much the same way. 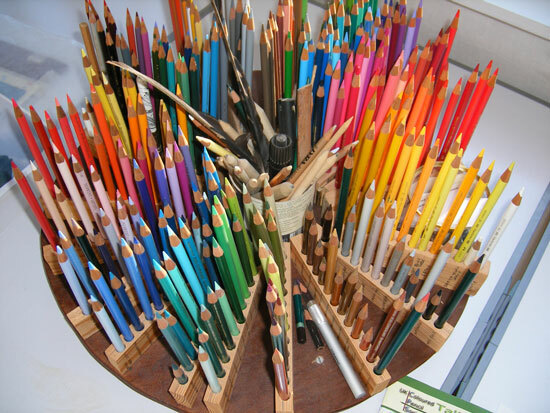 For blending Coloured Pencils and Pastel for Parchment and other work on vellum or paper. 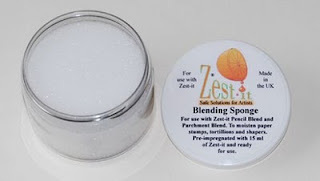 An easy, clean and convenient way of using Zest-it to moisten paper stumps, tortillions and shapers. Pre-impregnated with 15 ml of Zest-it and ready for use. Re-moisten when necessary with 5 ml of Zest-it Brush Cleaner, Pencil or Parchment Blend. Then I took a look at the website page which pictures the product. So - the bit I'm puzzled about - given the photo on the website page - is where is the sponge!? Has anybody got theis product already - and if so, how do you find it. More particularly, have you written a review of it which I can link to? Those who own Unison Pastels know that their size and shape means that they don't always fit easily into conventional pastel boxes with slots - and some pastel storage boxes can be very expensive. Plus the nice bit about Unisons is that you can buy sets relating to a colour and it's nice to be able to keep them all together. I've still got mine in their original boxes with the foam inserts! 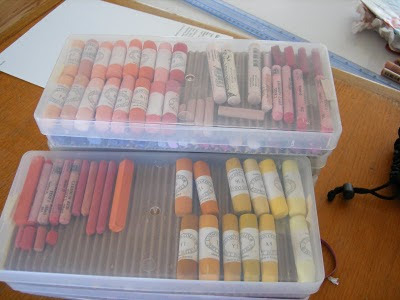 Lesley Crawford wrote to tell me about she stores her brand new Unison Pastels. I was researching storage boxes, and found these when I googled plastic boxes. They were called boxes for peel-off stickers - something to do with card making I think. They all fit neatly onto a table when opened, and stack with a very small footprint if I need to put them away, and being so light and small are ideal to transport. It's as if they were made for Unison pastels. I won't tell you how many boxes are filled yet!! Above and below are photographs of Lesley's pastel boxes. The boxes seem to be something called Peel Off boxes by Weston Boxes. They sell for £4.60 for a pack of 5. There's also a range of transparent boxes in lots of different sizes.